President Edgar Lungu has arrived in Rome, Italy, ahead of his official visit to the Vatican, on Friday. This is at the invitation of Pope Francis. ZNBC’ s Mwila Nsofu reports from Rome that President Lungu, who is accompanied by First Lady, Esther, arrived at Fiumicino Airport, on Thursday, at 13:55 Hours Zambian time. 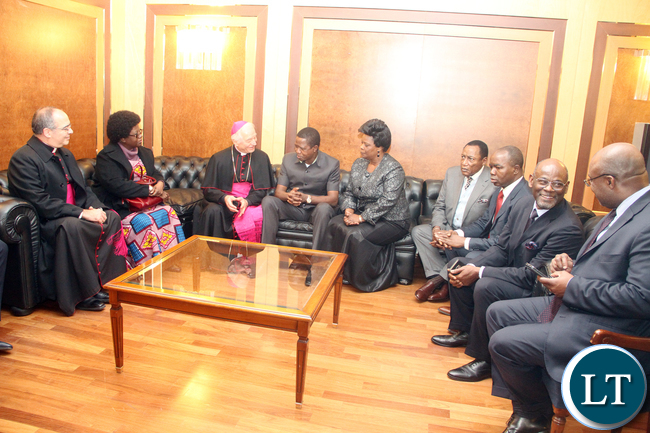 Foreign Affairs Minister, Harry Kalaba, Zambia’s High Commissioner to the United Kingdom and Ambassador to the Vatican, Muyeba Chikonde and Zambia’s Ambassador to Italy, Getrude Mwape welcomed the President. During his official visit to Europe, President Lungu, who left the country last night, is also expected to also visit France, at the invitation of President Francois Hollande. According to President Lungu’s programme, will on Friday, hold a meeting with Pope Francis and the Vatican’s Secretary of State, Cardinal Pietro Parolin. 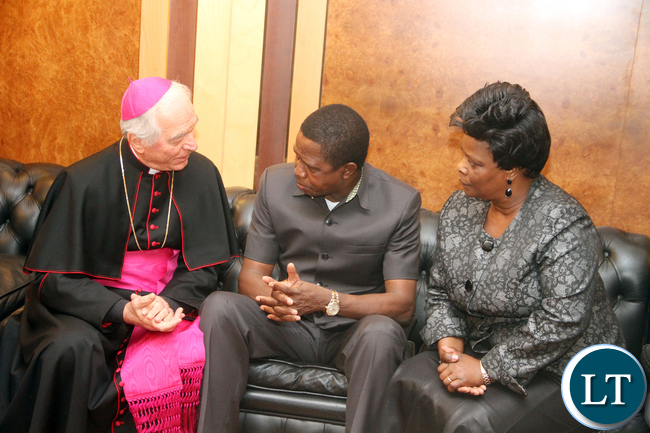 During the two-day official visit, President Lungu will also tour Saint Peter’s Basilica. And Mr Kalaba has told Journalists in Rome, that the visit of the President is historic and aimed at cementing the relations with the Catholic Church and the Vatican, in particular. Apart from meeting Pope Francis, President Lungu is also expected to hold bilateral talks with the Food and Agriculture Organization -FAO- and International Fund for Agricultural Development -IFAD. President Lungu is also expected to meet Zambians living in Italy, before leaving for France, on Saturday afternoon, for another official visit. In France, President Lungu, who left the country on Wednesday night, will hold meetings with President, Francois Hollande. 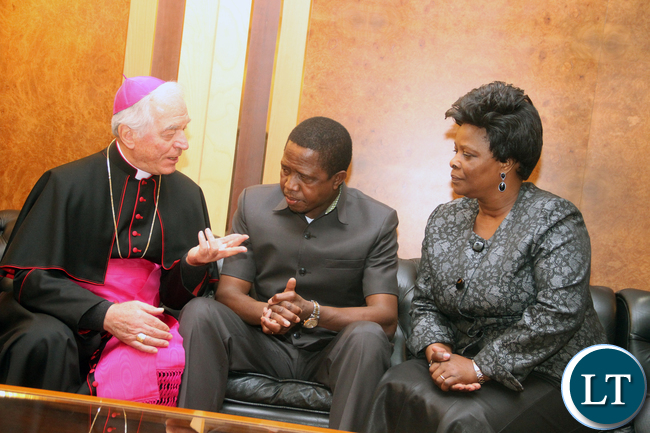 Mr Lungu becomes the third Zambian head of state, after the Late Levy Patrick Mwanawasa and Former President, Kenneth Kaunda to visit the Vatican. Is this good news or what?? Is it news at all?? With no ill-intent, what is the meaning of ‘NEWS’ in your intellect understanding? I must say I’m not a fan of that jacket I don’t understand that everyone else is wearing suits and our president is wearing a short-sleeved one what’s going on?! It must be cold in Italy at this time of the year. I hope Italian designers will fall stampede trying to give him a new wardrobe. New sharp Italian suits will be great. Was he not told that in Europe it is winter now?? He will freeze if all he has carried are short-sleeved jackets! That ka short sleeved appears to be casual, not fit for such meetings. And you wonder why Africans we never be free…with such leaders mentally enslaved…very disgusting!! Zonda uzalema. some people will go to their graves with bitterness embedded in their hearts. Mitudu zina kaya chabe! What has this got to do with tribe namwe. The country is burning & the guy is out romping. You should have seen the way Micheal Kaingu & Davies Mwila were threatening to use maximum force on innocent citizens. All because this is free reign. We are lucky we are a ‘peaceful nation’. Elsewhere these are times when coups’ de tat take place. koma nganimwe. mind your business guys. respect him ,he is the head of state. if you want to be a president register your own political party. the man will be proscuted by the courts of law.he is not going to be in power forever. PF, you mad bring back our, ba so called first lady na human hair from chawama?